Saturday September 26 Panel: "Bicycling in a Time of Crisis" l-r David Walthall, myself, Claudio Sabelli Fioretti, Tito Boeri. 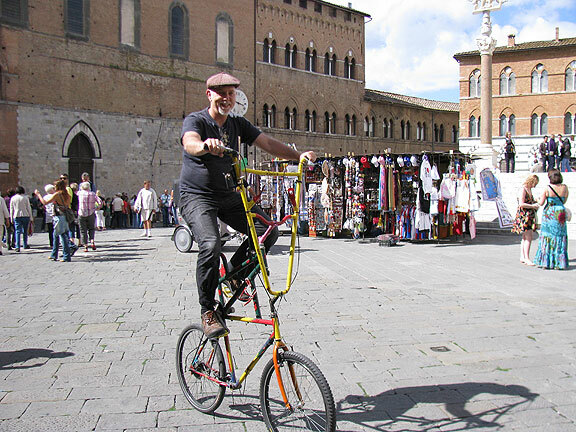 Touring the Piazza del Duomo in Siena the right way! On Saturday afternoon, after a group claiming to be the first “rock on bike” group played an upbeat set while sitting on stationery bikes (OK, Bike Music Festival SF, your place in history is being challenged! ), a talk called “Lentamente” or “Slowly” was held, featuring Wu Ming 2, a guy who is part of a collective writing group that produced the amazing novel Q amongst others. I couldn’t follow it too well, but the moderator was Claudio Sabelli Fioretti, a well-known journalist in Italy, and apparently an avid pedestrian. He was also the moderator for the Talk I was featured in, which had to move from the now windy and rapidly cooling Piazza Jacobo della Quercia (beneath the forever unfinished walls of the Cathedral extension) to the old Hospital, now a museum, adjacent to the larger Piazza del Duomo. 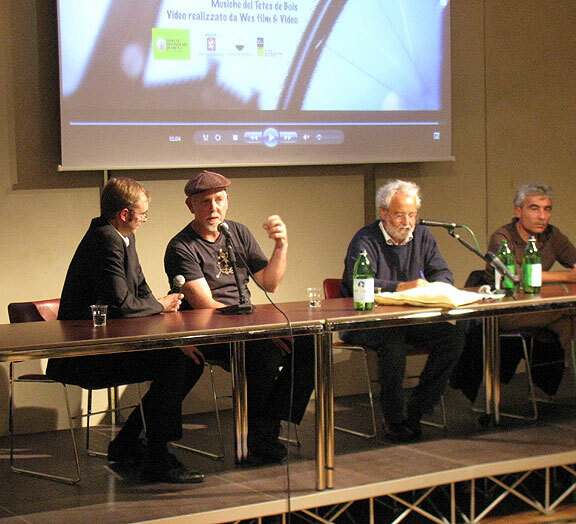 The topic was “The Bicycle in Times of Crisis” and it was me and a lefty economist Tito Boeri. He seemed a lovely guy, but we ended up going at it in a friendly but contentious way for a good hour, which I think made for an interesting panel to watch! The first-ever "Rock on Bike"?? I don't think so! Before we started I met both Tito and Claudio, and Tito told me he wasn’t going to speak too long, since he didn’t think he had that much to say and I was the “expert.” We laughed about that, and I figured we’d have an interesting conversation. When it started though, Claudio (who doesn’t speak too much English), turned to Tito and asked him about the crisis. Fifteen minutes later he finished a lengthy discourse on the crisis, the fact that it’s not just a cyclical downturn, and that restoring growth was an essential task. The bicycle was framed as one of a number of “new industries” that might somehow be the catalyst for further growth in lieu of the obviously moribund and historically finished auto industry. Turns out Tito is a pretty standard economist and doesn’t think outside of the normal categories of economics. OK, that’s not so surprising. As usual I situated the bicycling movement in a broader context of a new way of reclaiming technological know-how, rejecting the debt ball-and-chain of car ownership, and seeing in it a new kind of work rooted in ecological sensibilities. On top of all that the bicycling culture is also producing new communities (my friends from Rome, all sitting in the front rows, being a prime example) which are often incubators for new political and cultural initiatives”¦ I even gave my back-handed endorsement of the Keynesian merits of a radical urban redesign program: so much work! So much stimulus for even a capitalist economy! Imagine rebuilding every house, every plumbing system, every street, to accommodate radically ecological (and reduced) uses of energy, water, etc. Putting dedicated cycle paths along every boulevard, separated from sidewalks and auto traffic by horticultural and artistic medians”¦ It is kind of amazing how backwards-looking mainstream economists and politicians still are. How is that none of them have embraced a transitional agenda, given all the work it would provide, all the wealth it would generate, all the amelioration for ecological crises it would offer? Mind-boggling, really. A partial shot of the gang dining before the heavy rains started. 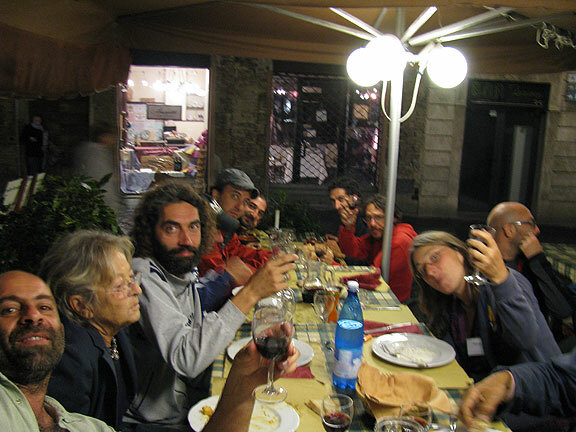 So after that we went out for dinner, about 25 of us, mostly Romans, and had a boisterous fun time in a quiet small piazza with an unoccupied outdoor restaurant. When it started to rain we had to crowd together under the awnings, but it was great. What a lovely bunch! The next morning Paolo and I had to reappear, along with Luca Conti who was the panel moderator, for a 10:30 roundtable on “Metropolitan Movements and the Experience of Working on Bicycles in Cities.” It started with me, then Paolo, followed by Roberto Peja, founder of the first bike messenger company in Milan (Urban Bike Messenger UBM), Francesco Ricci from the Pedicab Coop of Florence, Corrado Scimia of a Ciclotaxi project (Cooperativa Sociale Blow Up) that is focused on employing ex-cons in Rome, and finally Fabio Masotti of the Friends of the Bicycle in Siena. 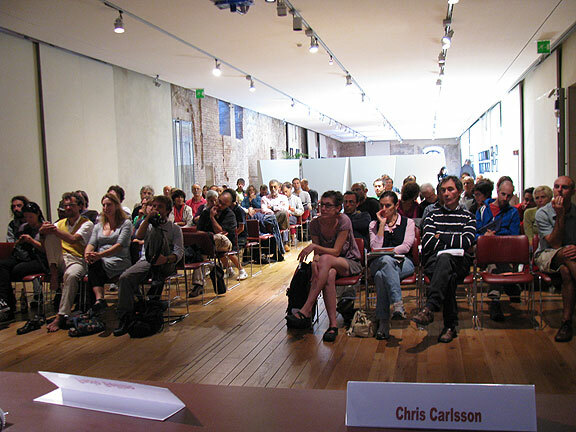 The audience at the morning panel on metropolitan movements and working and bicycles. David was on hand again to help me follow the other presentations, and to do a lovely job of communicating mine to the mostly non-English speaking audience. I was a bit groggy so early on Sunday morning, and hadn’t prepared myself at all until about a half hour before we started. Then I decided to do another layered loop looking at three kinds of work as related to bicycling: working in a wage-labor context in shops or as messengers; the work of commuting, which isn’t always seen as such, but by bicycle commuting one is reclaiming time and mental space from the frenzied pace of traffic and work; and the work I wrote about in Nowtopia that so many DIY cyclists are involved in. I managed to loop it around and through Critical Mass, the art of living, the exodus from wage-labor”¦ well, if you’re a regular you’ve heard it all before! 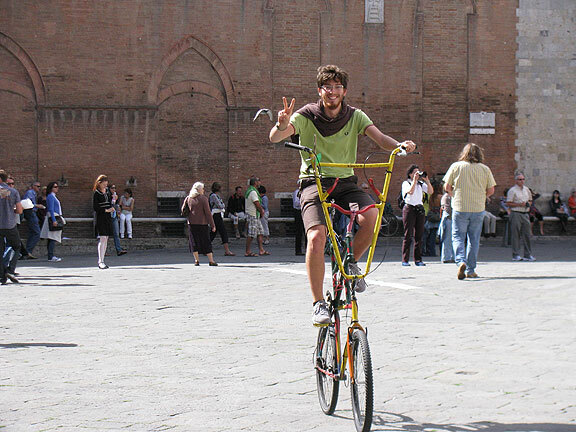 Paolo started making bike frames in his basement in the heart of Rome and his work has become famous far beyond Rome now. He learned from some oldtimers who showed him some artisanal tricks and the simple elegance of his work inspires many. He ran for local office recently, unsuccessfully, but he continues to be an important voice raising issues that are mostly ignored in the Italian political milieu. Among other things he’s an advocate of simple living, slowing down, and living well, and as someone who has stayed at his house, I can tell you, he lives up to it! Peja from UBM was wearing his spandex uniform, black with chartreuse racing stripes, and part of his presentation was to emphasize his efforts to change the image of bike messengers away from the familiar outlaw, scruffy, rebellious types by providing uniforms, standard bicycles, ID, insurance, etc. He was particularly proud of having started his company two years ago in a market dominated by scooter-based delivery companies, and had built up his client base to 150, largely on the argument that bicycles were faster and more reliable even than scooters. One of his clients is a big German company that is partly owned by its workforce, and so they were very concerned about the conditions of UBM’s riders before they signed on. Roberto talked about how hard it had been to acquire insurance but how he eventually did from a Genoese company specializing in transportation insurance. He saw his efforts as part of the broader political movement to expand bicycling as both an ecological and social good. Francesco Ricci from Florence told an incredible story of eight years of bureaucratic obstructions and harassment, leading up to the present in which his small pedicab company is only in a probationary period to see if it can work. This is despite all these years of doing it, getting fined, selling advertising on the fleet, having his riders surrounded by cabbies complaining they were stealing their business, having one of his drivers and vehicles impounded for unpaid fines, and a host of other bizarre and seemingly only-in-Italy stories. Sure enough, Corrado Scimia in Rome told similar stories. Apparently it was illegal throughout Italy to charge fares to ride in a vehicle powered by humans, on the grounds that that would be a form of slavery! That law has finally been adjusted as of 2009, but it took many years of pressure in Florence and in Rome. The Roman Blow Up coop has been working with ex-cons, putting them to work with tourists, pedaling them around town. As Scimia emphasized in a long and very passionate speech about his efforts, putting them on ciclotaxis is a lot cheaper them keeping them jailed. Moreover, the experience helps them rediscover the child-like joy of cycling, while integrating them with people on a whole new basis, telling stories, laughing, etc.Â Sure, he said, they ask tourists for money” but now they do it with a smile, where once they did it with a pistol! The Roman pedicab drivers don’t have the same problems with taxi drivers that the Florence ones did”¦ Their criminal background offers them a kind of protection! Overall it helps these guys get back a sense of being socially useful, the first and most important step in keeping someone from going back to their previous life. Scimia is a powerful speaker and his stories were so heartfelt and well-told that everyone in the audience and all of us on the panel were wildly impressed. 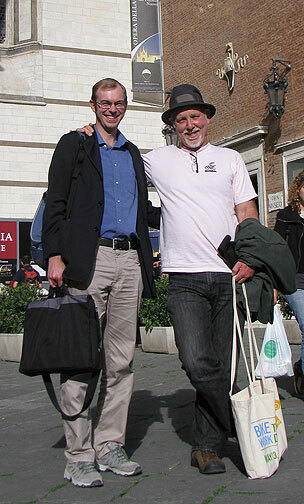 My wonderful translator David Walthall and me! The last speaker, Fabio Masotti, admitted he was bitter. In Siena and the surrounding Tuscan countryside, there are billions being spent on pointless road-straightening projects instead of building dedicated cyclepaths to serve the needs of the thousands of tourists that come to ride in Tuscany every year.Â He was frustrated that Italy, situated pretty close to the cycling “utopias” of northern Europe, was not learning any lessons or adopting any of the sensible possibilities tried and tested there. He noted proudly that the center of Siena had liberated itself from traffic, and emphasized that he was not seeking a monopoly for cycling, but rather more livable cities. He wanted to return public spaces to daily uses and break the habit of seeing bicycles only for sport and recreation. (Even on the bike tour I took in Chianti, the tour leaders were all decked out in racing spandex and had all the latest gear.) 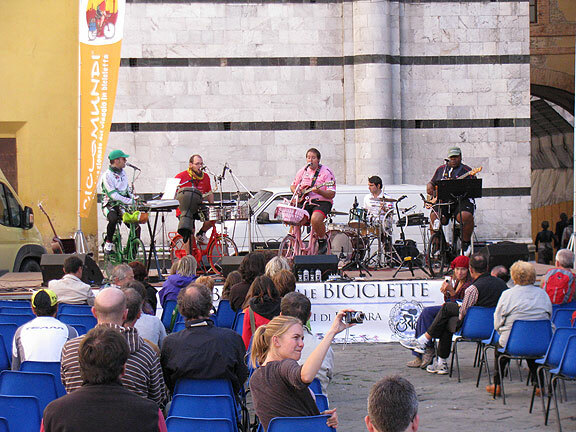 A new project his organization, Friends of the Bicycle in Siena, was pursuing was called “Bimbi in Bici” or Kids on Bikes, with the goal of returning the streets to kids, the elderly, bikes and pedestrians, wherever possible. All in all, the breadth of the panel was truly impressive. And instead of a preponderant focus on the problems of small business (which could have easily happened, given than half of us were coming from that point of view) there was a refreshing interest in and openness to the broader political and social issues that contextualize all of our efforts to make bicycling more of an everyday option for everyone. It was great to be part of it! Mostly Romans but other friends too, standing in front of our favorite restaurant right before we got seated. Afterwards we went out for another great meal at our favorite restaurant, Osteria Babazuf, who not only fed all 30 of us great pasta with mushrooms, and many of us their amazing tender roast beef with arugula or mushrooms, but at the end gave us some of their house Limoncello to celebrate with. This is a great restaurant if you’re ever in Siena! We said our goodbyes and everyone headed back to their starting points. The Ediciclo crowd had to pack it all up and return to Portogruaro near Venice, to keep the flames alive until next year. Well done! 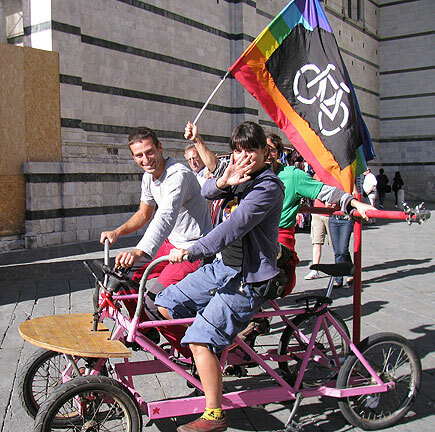 Ilaria in Bici waving from the quadracycle that they brought from Rome to ride around the Piazza del Duomo. 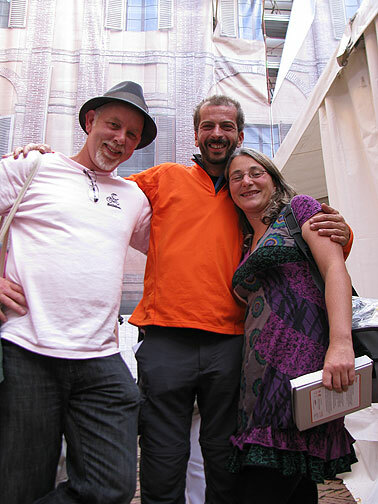 Me and Luca and Rosella in the Ciclomundi exhibition space. Erica Fontanel, one of the key staffers at Ciclomundi. 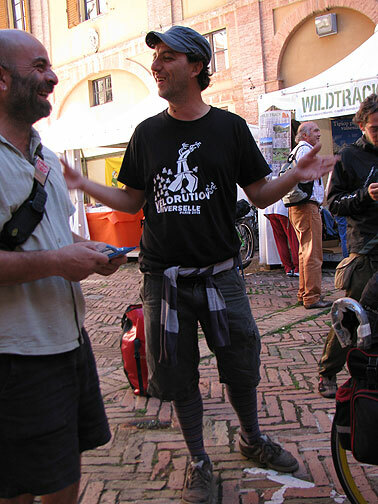 Paolo and Carlo, the latter modeling the lovely t-shirt of July's Velorution Universelle in Paris. Ciao Chris, I’ve read all of your Siena diary and I’m really sorry about the discussion with Boeri and the problems with Sabelli Fioretti. For us Ciclomundi and Ediciclo are not only a mission but a passion, and we trust in a future on bicycle! 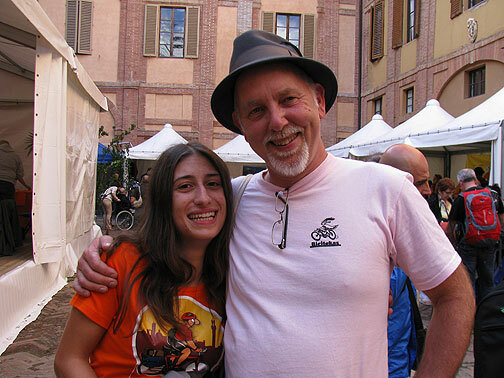 I thank you for all of your nice words about us and I hope we could keep in touch and have already occasions to meet… perhaps for your San Francisco book… I’m very glad to have meet you in Siena, you are a very good person, smart, kind, with a nice smile! Thank you for all and have a good italian tournÃ©e!